addon | Analyze the Data not the Drivel. I have pushed out a JOD update that makes it possible to run the addon on J 8.02 systems. In the last eight months a QT based J IDE has been developed that runs on Linux, Windows and Mac platforms. To maintain JOD’s compatibility across all versions of J from 6.02 on I had to tweak a few verbs. The only significant changes are how JOD interacts with various J system editors. I have tested the system on Windows J 6.02, J 7.01, J 8.02, and Mac J 7.01 systems. I expect it will behave on 32 and 64 bit Linux systems from J 7.01 on, but I have yet to test these setups. My hardware budget limits my ability to run common variants of Windows, Linux and Mac systems. JOD is still not complete; that’s why the version number has not been bumped past 1.0.0. The missing features are noted in the table of contents of jod.pdf, (also available in the joddocument addon), with the suffix “NIMP,” which means “not implemented.” I will fill in these blanks as I need them. Most of the time JOD meets my needs so don’t hold your breath. 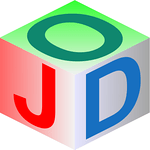 If you want to make your own additions to JOD the program and documentation source is available on GitHub. Just follow the links and enjoy. As a last note: I will be at the J Conference in Toronto (July 24 and 25, 2014) where I will be giving a short presentation and handing out a few hardcopy versions of the JOD manual to one or two JOD fans. The J addon JOD now runs on Macs. You can update JOD, or install it for the first time, with JAL. JOD now runs on all the major J hosts: Windows, Linux and the Mac. To keep track of host specific features I have started a series of version documents. The Mac document is here. At the upcoming J conference, (July 23-24, 2012), in Toronto I will show an iPhone version of JOD. And, as a reward for attending the conference and my little presentation, Writing Portable J addons, I will be raffling off hardcopy printed versions of the JOD manual. An updated PDF version of the JOD manual is available here. For more see The JOD Page.